Arrival and departure dates are open days with no formal activities scheduled. To provide maximum flexibility for travel arrangements, students are not required to arrive or depart by a specific time on those days. If flying, students are advised to plan travel arrangements around daytime hours in order to utilize public transportation to/from the airport. Students are encouraged to consult the Packing and Prohibited Items check list before their trip to Pittsburgh. Travel expenses to and from Pittsburgh are paid for by the i3 program. Airfare is paid directly by i3; baggage fees are not paid for or reimbursed. i3 Scholars who are flying to Pittsburgh are encouraged to take the Port Authority Bus: 28X (airport flyer) from the airport and disembark at the Fifth Avenue at Bouquet Street bus stop on campus to check in at Panther Central and check in with campus housing. Bus fare from the airport to campus is $2.75. Riders paying with cash should use exact change as the operators will not make change. See here for more information about the Port Authority transit system. SuperShuttle, Uber, Lyft, and taxis are also available from Pittsburgh International Airport. Students should arrive at Panther Central to check in with campus housing. Students taking a bus or train to Pittsburgh will need to make their own travel arrangements. MegaBus, Greyhound, and Amtrak all provide service to Pittsburgh. Students arriving by bus or train are encouraged to take a taxi, Uber, or Lyft to campus — there is no direct Port Authority bus line from the stations to campus. Transit expenses, including from the bus or train station to campus, will be reimbursed by i3. Students traveling by car should check in at Panther Central (located in the lobby of Litchfield Towers) to pick up a room key and then go to Ruskin Hall. Street parking is available on Ruskin Avenue (in front of Ruskin Hall) and is free on Sundays. Students will be reimbursed for the mileage from their home to the University of Pittsburgh. Students parking a car on campus for the duration of the Institute must request a parking pass at least two weeks prior to arrival. Parking passes will be distributed at Ruskin Hall and are paid for by i3. Once on campus, students must check in at Panther Central (located in the lobby of the Litchfield Towers) to pick up a room key. Students should then go to Ruskin Hall to move in. For help navigating campus, please refer to the University of Pittsburgh Campus Map. 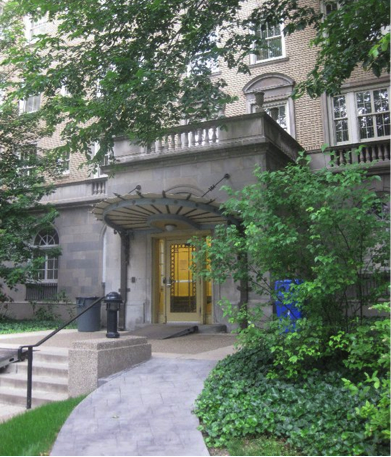 Ruskin Hall is located near the Cathedral of Learning on the eastern edge of campus. Newly renovated Ruskin Hall houses 416 students in one, two, and three-person apartments and single-person efficiency apartments. The air-conditioned, furnished apartments include private baths and kitchens with a refrigerator, stove, microwave, and dishwasher. Ruskin Hall offers basic cable television hookups in each living area and bedroom, and an Internet connection in each bedroom. Common areas will also offer wireless Internet access. Each unit and all common areas are equipped with sprinklers and regularly scheduled fire drills are conducted.